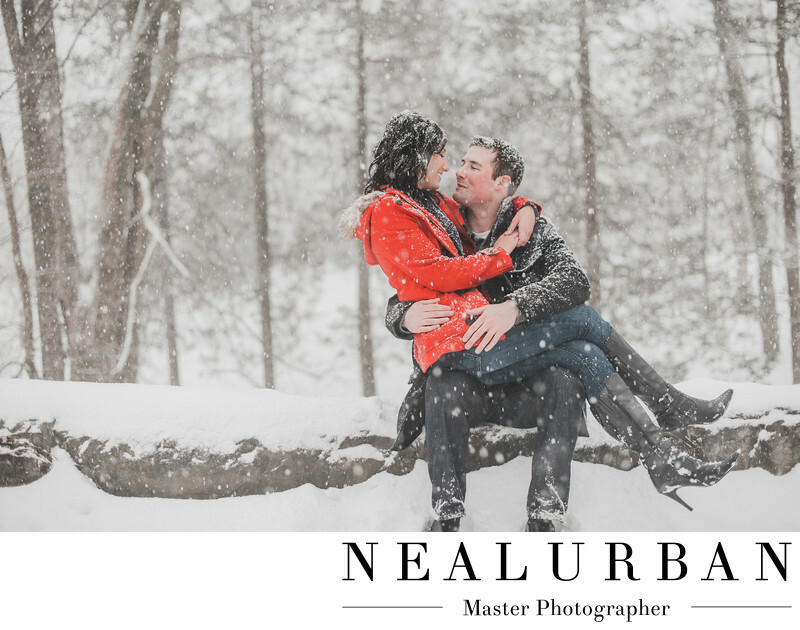 We love winter engagement sessions! If people are planning a summer wedding, winter will give the best contrast for photos! Kellie and Jesse definitely had a winter wonderland for their session at Delaware Park in Buffalo. It was freezing out! Hoyt Lake was frozen over and there was an ice hockey tournament going in! The park looked amazing with the snow! Every inch was covered! This is exactly what this couple was hoping for. We walked around the park and stopped for photos. We didn't even need to go too far into the park either. Everywhere we looked we could get amazing images. We did walk into some wooded areas though. We noticed a big tree was down and wanted them to sit down. Jesse had a seat and his lovely fiance had a seat on his lap! They got nice and close to stay warm. You can see how cold it was from their red cheeks and noses. Pure Buffalo weather! We all had so much fun on this engagement session. They were so playful and laid back. They had a snowball fight at one point as well! On the wedding day, it was extremely hot and humid. We went for photos down by the Lewiston waterfront. We loved the contrast we got from engagement to wedding photos! Location: 199 Lincoln Pkwy Buffalo NY 14222 United States.